Introducing this fun collection of Kids Genuine Ford official licensed products released from the Ford Motor Company stable. Each Kids product line is licensed, tagged and manufactured in high quality materials, featuring highly detailed artwork, eye catching colours and contrasts, and are very cool to wear. 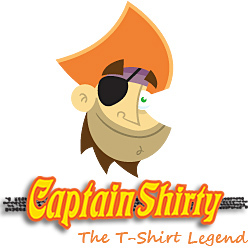 At Captain Shirty, we cater for 6, 12, 18, 24 months in our Baby Romper selections, and between years 2 and 12 for the Kids "youth" selections. These brillant pieces include manufacturer models such as Mustang, F-Truck, and Hot Rod! 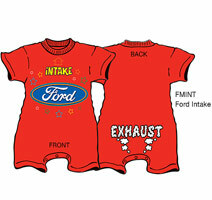 We update the car t-shirt designs with new releases as production becomes available. If you have any enquiries relating to our Kids Ford Muscle Car T-shirt product lines, please do not hesitate to contact us via email or by phone. 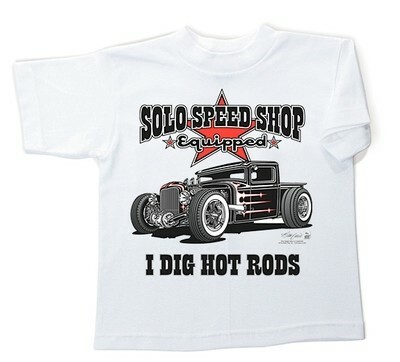 Solo Speed Shop Hauler Kids "I Dig Hot Rods"